What happens when you window-shop garden catalogs in winter? Your wishlist and shopping carts grow longer by the time spring arrives. Here is my current wishlist of flowers, which covers the gamut of annuals and perennials, seeds and tubers/bulbs. I’m going for some early flashy color this season, which is why annuals made it into my list. …and a large white-flowered reblooming evergreen daylily, perhaps a spider form. I am still researching the white daylily as there are many cultivars available. Many online stores have huge selections of white/near-whites…now it’s just a matter of time trying to discover a particular Hemerocallis that will fit all my criteria. I’m also expanding my blue-and-white garden, as evidenced by the number of blue flowered plants on my wishlist. I’ve been pushing DH for an action plan on our backyard since late last year. The major expenses and problems associated with a grass-less backyard could have been avoided if he had just been a little motivated to spread some grass seed around. Every drop of rain turns the yard into a mudpit, which gets tracked in by some eager pups. It has gotten to the point where the dogs have to use the front yard bathrooms because of the excessive mud tracks left into our light beige carpet. The cleaning bill adds up every year.I also inspected the retaining wall this weekend and I calculate that the earth has shifted at least 2 inches toward our fence. Again, I can fault DH’s slapdash assembly of the wooden wall and foresee future expenses in having to rebuild the wall and our back fence. At this time, it looks like a train-wreck of a wall, running crooked across the back yard. Luckily it isn’t visible to the casual observer, but I can see it collapsing some day. While I’m on this rant, I might as well also mention the fence stain job that has remained incomplete for 2+ years now. Well, DH surprised me yesterday in purchasing a small amount of bermuda sod from A-1 Grass to lay in the dog run. It’s not enough to cover the entire backyard, but it’s a start. It remains to be seen if he will actually do any prep work on the yard before laying the sod. Heck, I’m skeptical…the soonest I can hope for is that he will lay down sod next year. Bitten by the gardening bug, I went ahead and dumped the rest of the unplanted allium and muscari in the last remaining flower bed, hoping that they haven’t festered too long in the confines of a cold, dark garage. Weather permitting, I will be rearranging them again tomorrow morning, since I only dug trenches and tossed them in without a single thought but to get them buried. After inspecting the other sprouting bulbs, I see that there is little art to planting a straight line of bulbs. I hope to scatter them even more. 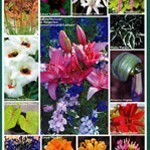 I also find myself browsing bulb/seed e-tailers and checking the selections on Ebay. I definitely plan on featuring more daylilies in the flower beds…but some of the more exotic cultivars fetch exorbitant sums online. I’ve decided to do a bit more research in finding the style and height I want. Of course, I had to go to Home Depot this afternoon to check out their perennial bulb collection. I walked away with 2 bags of Crimson Pirate Daylilies, 2 bags of mixed Aquilegia and a 6 pack of Lollypop Asiatic lily bulbs. I have every intention of getting them into the ground this weekend. Now, watch it rain tomorrow…. 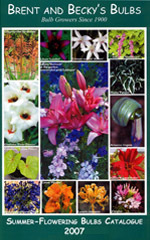 It’s that time of year again when online and mail-order nurseries bombard the mailbox with their colorful harbingers of spring: the plant and seed catalogs. As usual, they are full of picture-perfect bouquets and irresistible plant collections, not to mention time-sensitive and money-saving offers, in an attempt to get gardeners to open their wallets. Nothing like a slew of full-color catalogs to get me started thinking about flower beds and landscaping. This year DH and I are committed to restoring the backyard to some semblance of a grassy lawn. DH and drought had effectively killed off most of the Augustine, though some of it has eked out an existence hiding in the lea of our house and under the fence’s shadow. We hope to seed some bermuda, water restrictions permitting, this spring in order to spare ourselves from a mud-stained carpet. Three pups can track in a lot of dirt and mud, among other things. The tulips and muscari I planted over November and December last year have sprouted, and thankfully, weekly showers have dampened the ground to sustain them. I haven’t determined if any of the alliums have burst through the ground. I hope to have some time this coming weekend to assess the flower beds.